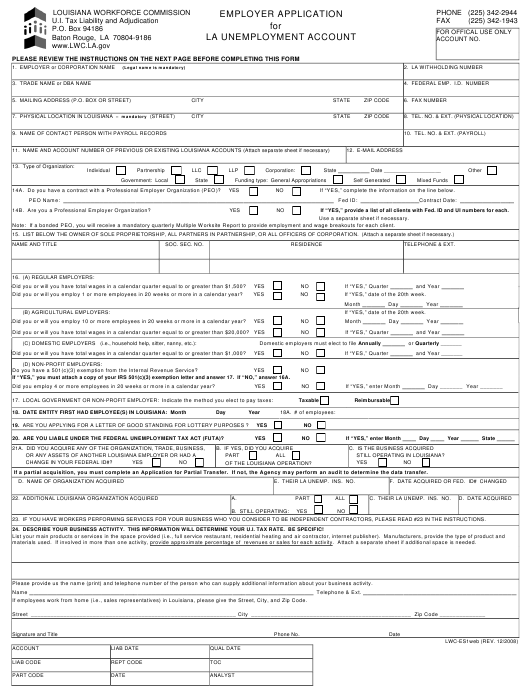 Form LWC-ES1 or the "Employer Application For La Unemployment Account" is a form issued by the Loisiana Workforce Commission. Download a fillable PDF version of the Form LWC-ES1 down below or find it on the Loisiana Workforce Commission Forms website. 14A. Do you have a contract with a Professional Employer Organization (PEO)? If “YES,” complete the information on the line below. 14B. Are you a Professional Employer Organization? If “YES,” provide a list of all clients with Fed. ID and UI numbers for each. Use a separate sheet if necessary. Note: If a bonded PEO, you will receive a mandatory quarterly Multiple Worksite Report to provide employment and wage breakouts for each client. Did you or will you have total wages in a calendar quarter equal to or greater than $1,500? Did you or will you employ 1 or more employees in 20 weeks or more in a calendar year? If “YES,” date of the 20th week. Did you or will you employ 10 or more employees in 20 weeks or more in a calendar year? Did you or will you have total wages in a calendar quarter equal to or greater than $20,000? Did you or will you have total wages in a calendar quarter equal to or greater than $1,000? Do you have a 501(c)(3) exemption from the Internal Revenue Service? If “YES,” you must attach a copy of your IRS 501(c)(3) exemption letter and answer 17. If “NO,” answer 16A. Did you employ 4 or more employees in 20 weeks or more in a calendar year? 19. ARE YOU APPLYING FOR A LETTER OF GOOD STANDING FOR LOTTERY PURPOSES ? 20. ARE YOU LIABLE UNDER THE FEDERAL UNEMPLOYMENT TAX ACT (FUTA)? CHANGE IN YOUR FEDERAL ID#? If a partial acquisition, you must complete an Application for Partial Transfer. If not, the Agency may perform an audit to determine the data transfer. E. THEIR LA UNEMP. INS. NO. C. THEIR LA UNEMP. INS. NO. 23. IF YOU HAVE WORKERS PERFORMING SERVICES FOR YOUR BUSINESS WHO YOU CONSIDER TO BE INDEPENDENT CONTRACTORS, PLEASE READ #23 IN THE INSTRUCTIONS. 24. DESCRIBE YOUR BUSINESS ACTIVITY. THIS INFORMATION WILL DETERMINE YOUR U.I. TAX RATE. BE SPECIFIC! materials used. If involved in more than one activity, provide approximate percentage of revenues or sales for each activity. Attach a separate sheet if additional space is needed. Please provide us the name (print) and telephone number of the person who can supply additional information about your business activity. If employees work from home (i.e., sales representatives) in Louisiana, please give the Street, City, and Zip Code. OR you are a local or state government employer. Enter your Louisiana Withholding Number (Louisiana Revenue Number). Enter the name by which the business is known or the “Doing Business As” (DBA) name. Enter the mailing address to which reports, notices, and correspondence should be mailed by this Agency. Enter your fax number if available. needed for coding purposes only; nothing is mailed to this address. Enter the telephone number and extension of your physical location. Enter the name of the person or company that prepares your payroll records or has knowledge of such records. 10. Enter the telephone number and extension of the person or company listed in #9. 11. Enter all LA Unemployment Insurance (UI) account numbers and names if you previously filed or currently file reports to LA. 12. Enter an e-mail address if available. the date of your PEO contract. Note: Employers may be liable for unpaid taxes of the PEO. a separate sheet if necessary. of the corporation. Attach a separate sheet if necessary. attach your 501(c)(3) exemption and answer #17. If you do not have a 501(c)(3), you will be treated as a regular employer; answer #16A. effective as of the IRS’s approval of such status. Taxable: employer pays taxes on wages paid to employees at a computed tax rate. Reimbursable: employer pays the actual cost of benefits paid to former employees. 18. Enter the month, day, and year you first had employees who were paid wages in Louisiana. 18A. Enter the number of employees employed when your entity first began in Louisiana. 19. Answer “Yes” or “No” if you are a Lottery Retailer. 20. If “Yes,” enter the date and state you first became liable to FUTA. individual to corp., corp. to LLC, etc.) with a Federal ID# change, this section applies to you. not, the Agency may perform an audit to determine the experience rating data to be transferred. 22. Did you acquire more than one LA operation? If “Yes,” answer A, B, C, and D. Use a separate sheet if necessary. such service is performed, and 3. Such individual is customarily engaged in an independently established trade, occupation, profession, or business. Sign your name and list title, phone number and extension, and the date. Mail or fax this Employer Account Application form and any attachments to the address or fax number on the first page of this form.